Would it make sense to add a musical note symbol to clarify that it is indeed lyrics? Perhaps turn it into a link to the full Hello Dolly lyrics so it has some context? Even without a link, a note symbol seems like an easy improvement adding some sort of context. See the screenshot with ​beamed eighth notes (&#9835;). 43632.PNG​ (1.8 KB) - added by SergeyBiryukov 13 months ago. 43632diff-bad-behaviour.png​ (38.8 KB) - added by audrasjb 13 months ago. 43632diff-nice-behaviour.png​ (32.3 KB) - added by audrasjb 13 months ago. 43632.diff​ (833 bytes) - added by audrasjb 13 months ago. plugin-off.png​ (140.6 KB) - added by desrosj 12 months ago. plugin-on-cramped.png​ (150.6 KB) - added by desrosj 12 months ago. 43632.2.diff​ (1007 bytes) - added by audrasjb 12 months ago. 43632-dolly-height.png​ (40.7 KB) - added by audrasjb 12 months ago. 43632-responsive-height.png​ (31.5 KB) - added by audrasjb 12 months ago. 43632-responsive-layout.gif​ (3.5 MB) - added by audrasjb 12 months ago. 43632.3.diff​ (1.2 KB) - added by audrasjb 12 months ago. 43632.4.diff​ (1.3 KB) - added by audrasjb 9 months ago. 43632.5.diff​ (1.6 KB) - added by audrasjb 7 months ago. 43632.6.diff​ (1.6 KB) - added by audrasjb 7 months ago. 43632.7.diff​ (1.7 KB) - added by audrasjb 5 weeks ago. 43632.8.diff​ (3.4 KB) - added by afercia 5 weeks ago. Thinking with accessibility in mind, would we want to have a screen reader read aloud the note or not? I'm thinking it's probably important to denote that it a piece of song lyrics so when read out it's not confusing it switches from settings to a song. but that might already be too integrated with audios in wp-admin so the suggested &#9835; would probably be better. Yeah, I considered using Dashicons, but they're only available in WordPress 3.8+, and I think there's a non-zero chance of someone updating the plugin on 3.7 or earlier (as unlikely as it may be), so using a Unicode symbol seems safer. With the changes in lyrics is this still needed? I wonder if we're adding confusion by adding a musical note? For example, would a user be even more puzzled? Would they think they should click to hear? I am not sure it helps in this instance. Additionally I wonder if the line should be displayed with quotation marks? But in that case I think we would need to translate the quotation marks, as they can vary in different languages. Hello Dolly is not using any translations, so that is currently not an option. Maybe there's an existing core string for quotations marks? But then again I don't think it's recommended to re-use translated core strings in plugins, as they can always change. but using that icon in front might look strange to some. With the changes in lyrics is this still needed? I wonder if we're adding confusion by adding a musical note? I think at least a screen reader comment for assistive technologies would be nice, as noted in comment:2. For example, would a user be even more puzzled? Would they think they should click to hear? I tried testing this with VoiceOver in Chrome, but I was unable to use the keyboard to actually navigate to the lyrics. I am a novice when it comes to testing with VoiceOver, though, so I could be missing something. That aside, the patch looks good, but I have a few things that I noticed. On mobile, the lyric gets a little cramped (plugin-on-cramped.png​). When the plugin is off, the Add New button is pulled up and it feels fine (plugin-off.png​), but I find myself wanting the height of the lyric to be similar to the Screen Options height, or at least have some bottom padding. The baseline for the lyric is also slightly off from the screen options tab and feels off to me. Note: indeed, you can't access Hello Dolly lyrics with TAB navigation on voice hover because you simply navigate through links. But I think this is nice: we don't need any anchor here. I tried testing this with VoiceOver in Chrome, but I was unable to use the keyboard to actually navigate to the lyrics. @desrosj to navigate trough all elements use Ctrl-Option-Right arrow (or Left arrow to go back). Your best option would be testing with VoiceOver and Safari though, not Chrome. Instead, Windows screen readers use the Up and Down arrows. I have to say I still feel the note is not needed here. I totally am ok with adding something in for screen reader text but the icon just feels out of place and like it's trying to be an interaction. Let's add a screen reader text without the note symbol then. @afercia can you please review item 4 of that "changelog"? 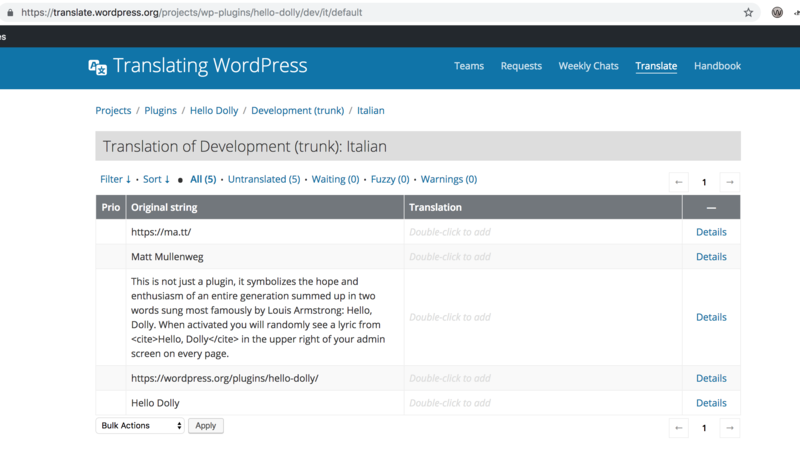 @audrasjb the lang attribute is a nice touch :) However, I think the screen reader text "Quote from Hello Dolly song:" should be translatable and the lang attribute applied only to the Hello Dolly text. However, Hello Dolly won't be translatable as far as I know, and that's why I added lang attribute to the whole parapgraph. @afercia Sooorry. Hello Dolly is now correctly prepared for translation! That was not the case one year before. I was wondering if we could move the extra space from the HTML tag, into the $lang variable? Also if we should use substr instead of strpos, since we are targeting the first three (non multibyte) chars? Also if we could avoid a very long echo line. I was also curious what are the available locales that start with en_. I could find these: en_US, en_AU, en_CA, en_NZ, en_ZA, en_GB on ​https://translate.wordpress.org. There seems to be English (Pirate) available too with art_xpirate ? Should it be included here? I have not added Pirate locale since it is pretty different than classic english (there is a lot of words from other languages). The patch doesn't apply cleanly and needs a refresh. When switching the admin to another language, e.g. French, I guess users would still appreciate to hear the lyrics with the correct screen reader voice and accent. "Quote from "Hello, Dolly", by Jerry Herman"
Noticed the current translated strings are in the admin-xx_XX.po file. Can someone confirm the Hello Dolly strings are considered "core strings" and thus we shouldn't add Text Domain: hello-dolly? Thanks. the parts Hello Dolly and Jerry Herman would need a lang="en" attribute because the song title and author name should be pronounced in English. However, for the sake of simplicity and to not add to many lang attributes, I'd lean towards keeping it as is. For history: clarified the text domain thing after ​conversation on Slack. The Hello Dolly version shipped with core doesn't need a text domain: its strings are considered part of core. ​The standalone version on the plugin repo does use a text domain and it gets synced from time to time with the core version. 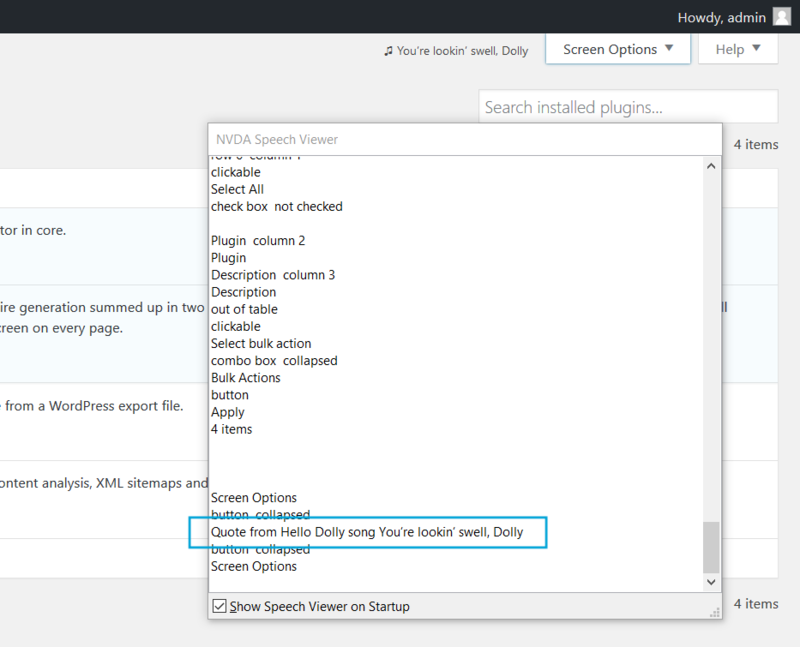 Accessibility: Improve the "Hello Dolly" accessibility. Props audrasjb, SergeyBiryukov, danieltj, birgire, karmatosed, desrosj, afercia.